To run a profitable remodeling company, your production team has to be better than “good”. They’ve got to be great. Your image and your reputation is a direct reflection on your production team’s success or failure. When things run smoothly, you get rewarded with referrals. To run a profitable remodeling company, your production team has to be better than “good”. They’ve got to be great. Your image and your reputation is a direct reflection on your production team’s success or failure. When things run smoothly, you get rewarded with referrals. A screw up, and you’ve got to deal with an angry client. 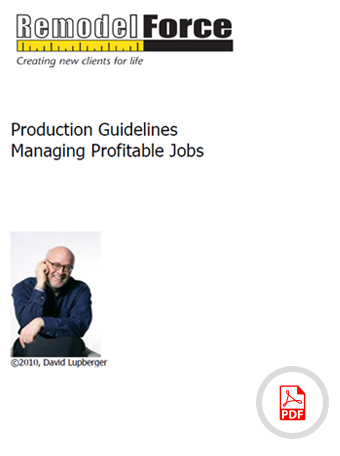 If you want to keep control of your jobs and have your jobs run smoothly, this Production Guideline Manual is a must. It covers everything from job site supervision, progress meetings, change orders, and handling things that can go wrong, to the final punch list and closing out a job.